Here it is without all the Forza-ing. Really gonna feel those once they go live later this year. Preview users are also getting a chance to participate in daily Killer Instinct tournaments via the new Arena functionality, create LFG posts for future gaming sessions and message with multiple friends at once. All of these changes will be rolling out to all Xbox One users later this year. Uhem, PlayStation has been doing this for years (minus the different sound). Way to finally get on board, Microsoft. 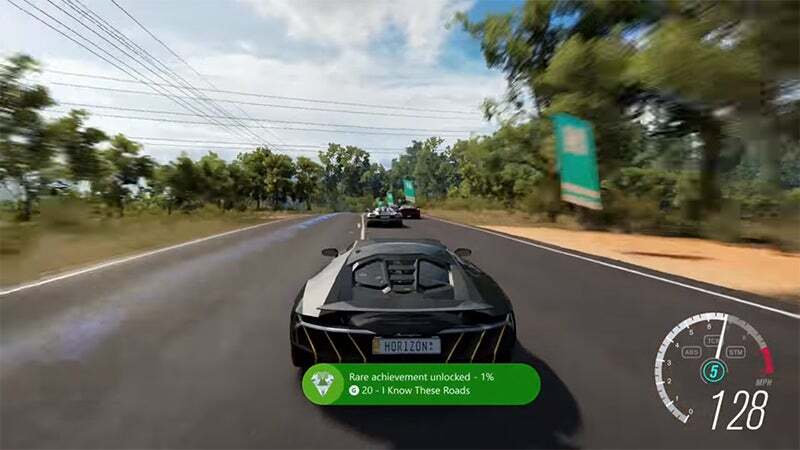 As I remember idea of a mandatory, uniform, tracked system of achievements was an extremely popular launch feature of the Xbox 360, that was borrowed later when Sony phased in an optional, software-dependent Trophy system for the PS3. So I’m not sure what part of this they invented, the trophies are different colours and grades instead of some just being worth more points than others? You should turn achievement notifications off either way IMO. Pretty annoying having an important, post-boss cut scene disrupted by a pop-up, with or without a rad noise. No they haven't. Sony have a system where the developers assign a rank to an achievement based on how difficult they believe it will be to obtain. It doesn't reflect the actual difficulty or rarity since it's just an estimate. It's similar to how Microsoft use point values on achievements. However if I'm reading this right this will use the new meta data systems so that only achievements that are actually rare will trigger this new sound. So regardless of what the achievement is worth if only a small percentage of players have it you'll get this special notification. I'm guessing they'll eventually adapt it to notify users if they're world first, first 10 and first 100, similar to how MMORPGs do it. I used to like achievements for the 360, but on the XB1 they take an absolute age to open, view and compare so I just stopped caring as it was too much effort. That, and achievements for dumb things like watching trailers kinda ruined it. Also, the XB1 is just a slow piece of hardware all round. Everything takes far too long to load. The 360 is faster at everything from booting, to loading DVDs, to checking any menu. actually achievements are really easy and fast to access ever since the side menu was introduced with the windows 10 update. speed in general has been increased also. nope, day one edition. works fine. don't use voice commands at all though - my kinect is not even plugged in, so no idea about that.